After a leisurely morning, including yoga on my own, I disembarked, had my picture taken with the guy in the eagle suit, then took a shuttle bus four blocks into Skagway. I had a few minutes to wander amongst the diamond shops in the restored gold rush town. Apparently, in addition to eating 22 hours a day, many people who take cruises want to save 5% on vacation diamond earrings, so you don’t have to worry about losing your good diamonds on the trip. I met my excursion back by the ship. 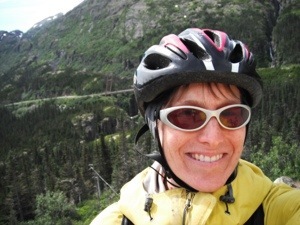 We hopped in a van to go to the top of Yukon Pass and bike back down. It had been rainy and cold for the last two weeks, but we had a beautiful clear and warm day! At least 13 miles of this 15 mile ride was coasting. 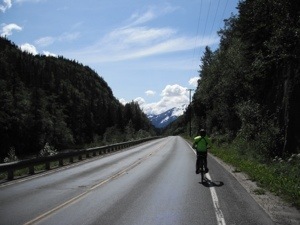 There was a small climb of less than a quarter mile, and a flat spot as we returned to town. One guide led the group, moderating our speed, which was fine with me. but big downhills and high speeds have always made me nervous. It doesn’t feel as fast without 60 pounds of gear pulling you down, and there was no Chicago traffic either, which was lovely. The view were stunning, of course. If I had to do it again, I think I might have liked to get up earlier in the morning, rent a bike on my own, and ride up the hill as well as back down it. But it felt great to be back in the saddle, even for a little bit. The ride only lasted about an hour, and only then because we stopped at several view points for informative talks. It always amazes me how fast you can cover ground coasting down hill. We learned about our guide, Kristina’s, history crush on one of the entrpeneurial and and adventurous founders of Skagway. 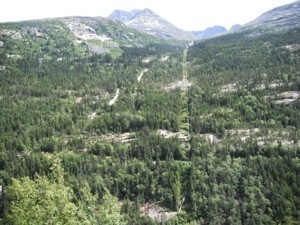 We also saw the narrow pipeline from a glacial lake that provides an abundance of hydroelectric power for the town. I also found out that Kristina has been taking aerial silks lessons, and she was very interested in any information I had about circus performing. 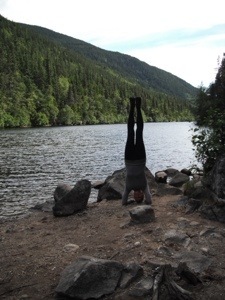 They even have a group that practices acro yoga in Skagway. Unfortunately, we weren’t staying in town long enough to jam. Nikki also explained how the town’s supplies arrive every Tuesday by boat, and they hadn’t showed up yesterday. She recommended getting a look at the empty grocery store before they restocked, as the boat had made it in today. I ate lunch after the ride at Starfire, the Thai restaurant in town. It has great yelp reviews and came highly recommended by Sadie’s boyfriend. Knowing about how it’s challenging to stock up in Skagway, I was only briefly surprised by the curt, five item menu. I’m so used to Thai restaurants having so many options!  Everything having so many choices, of course, but some instances make it stand out more. The pad thai was yummy. took about 40 minutes, with a few twists and turns. 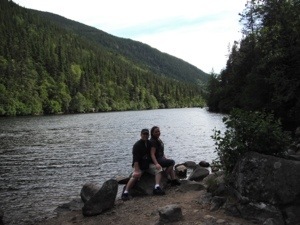 We met one couple who had not found the lake and advised us to turn back. We followed the path in the opposite direction from where they had come. 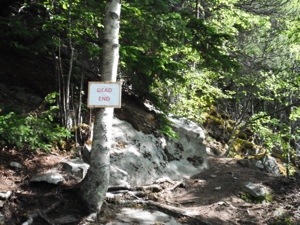 Then we ran into another couple who had easily found the lake, and felt the trail was quite well marked. We arrived at the lake without too much more confusion, and we played around the shore. Becky waded into the freezing water again, while Ben and I watched. 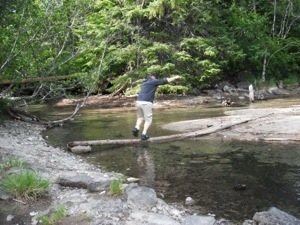 Ben did not fall into the water balancing across this bouncy tree limb to a sand bar, but he certainly looked like he was going to. We couldn’t see the end of the lake, but decided to start walking the loop trail around it. We still had two and a half hours before the ship was to sail. 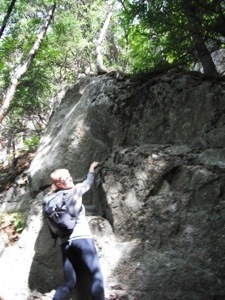 The first section was slow going as we picked our way through boulders and roots, and we still couldn’t see the other end. After about 20 minutes, we were wondering if we should turn back. Then a family crossed our path going the opposite direction. It had taken them only an hour and a half to get up the hill and most of the way around the lake, so we knew we’d be fine. They also said the path was about to smooth out. What a beautiful day of adventures! So much moving around. I guess I’ll have to make up for it by eating extra desserts! Oh wait, I do that on the cruise anyway.